Our stay at the Hostal El Español is drawing to an end. We have been here two nights and will spend one more. 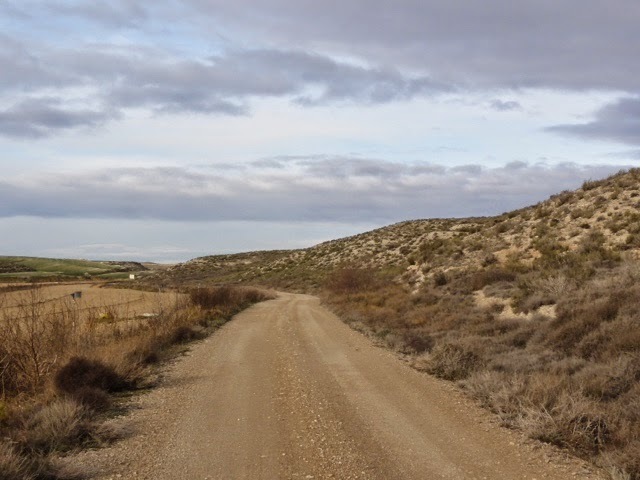 We have done a lot of shuttling around by taxi during our time here but it has all worked out, and El Español has been a good central location for us. 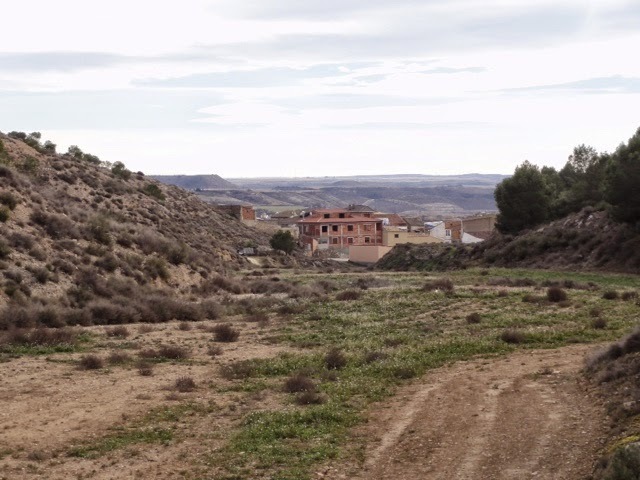 But, today we start out on foot from our front door as we walk from Bujaraloz to Candasnos. Some light rain had fallen early last night, but there were no traces of it as we stepped out to cross the highway and find our way out of the village. The weather was fine. Temps were right at 40 F, with partly cloudy skies, and best of all, no wind (very little anyhow). 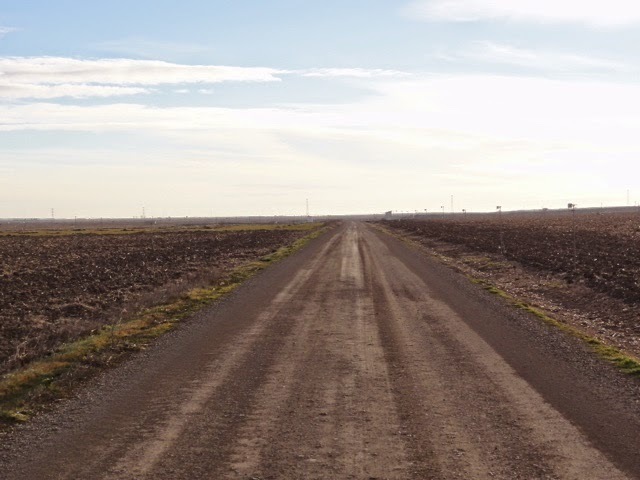 Our first view this morning, as we headed out of town, was of a broad flat plain pierced by an arrow straight trail. The partly cloudy skies provided Much appreciated relief from the sun as it rose muted and indistinct behind a veil of clouds. Much better than having it burn through your eyeballs as you head right into it first thing in the morning. The plateau we are on, we discovered, has some interesting features. 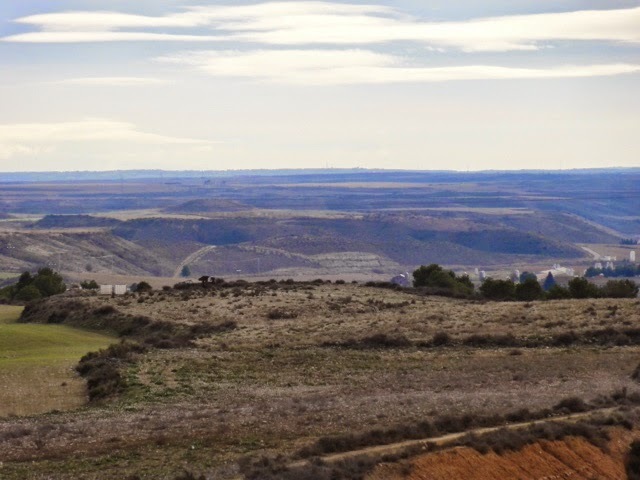 At low angles it appears dead flat, but once you gain some elevation (we had hills today) you can see it is actually a series of very large mesas separated by large arroyos or small valleys. We have been been following the N 11 highway for the past few days and today was no exception. One nice thing was that for a good part of our walk today we were separated from the actual highway, and that brought a different feeling of peace and quietude that you just can’t conjur as large trucks are racing past just on the other side of the guardrail. We remain alone in our small pilgrim universe. Even after acknowledging the occasional Santiago bound pilgrim passing through, and the increased Ignaciano traffic in warmer times of the year, pilgrims must still be a bit of an anomaly here. I feel the locals must struggle to understand exactly what it is that we are doing. Even the girl at the bar this morning gave me a ‘mucho frio’ gesture as I headed out the door as if to ask why would you want to out and walk in the cold. Fair question actually. But, out we went and made a good day of it. 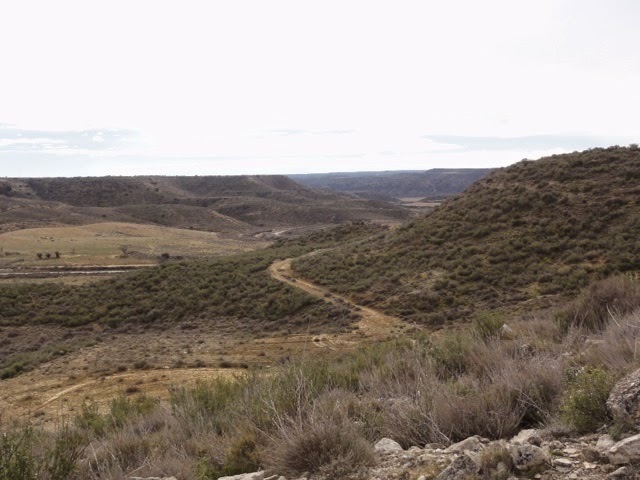 We enjoyed some of the varied terrain today, as we have seen scant few hills these past days. One section, at the bottom of a steep slope down from the highway was a muddy slog through stiff brush and tall grasses. But, apart from that it was quite a pleasant day. 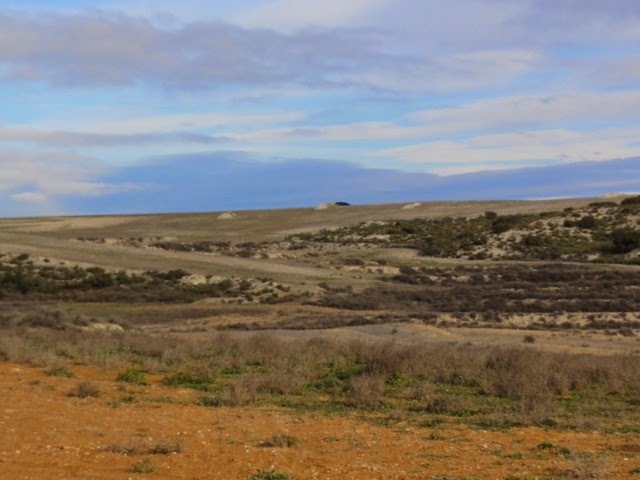 By early afternoon we had arrived at a point that gave us an unobstructed view down to Candasnos sitting alone out on, yet another, broad flat plain. 45 minutes later we had Carlos on his way to give us a ride back to Bujaraloz. 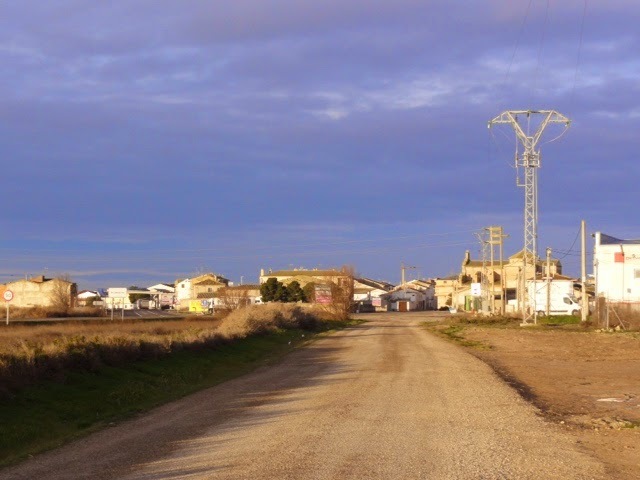 Tomorrow morning Carlos will return us to Candasnos so we can walk on to Fraga our destination for tomorrow night. This will be the end of our taxi shuttling as we now have lodging at all places where we finish for the day. By Wednesday we will be entering Catalunya, our last province. Here we will start gaining elevation as we head towards Montserrat. We are now 8 days from Manresa (but who is counting). 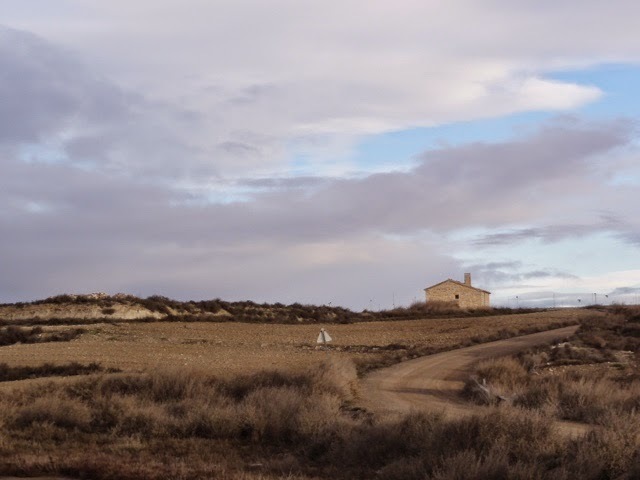 All is well here on Los Monegros.